Palpitations are experienced when the heart rhythm differs from the normal range. This rather unpleasant sensation, commonly experienced by menopausal women, has various causes, ranging from heart disease to lifestyle habits. However, psychological factors, particularly anxiety, are one of the most frequent causes of palpitations. Keep on reading to learn about the link between anxiety and palpitations. Experiencing anxiety is a normal and healthy reaction to various life situations. It involves being occasionally worried, nervous, or scared. However, when anxiety episodes are frequent and persistent, and they significantly impair one's life, anxiety is classified as generalized anxiety disorder (GAD). It is further divided into six disorders, such as panic disorder or obsessive-compulsive disorder. It is estimated that one third of the whole population is affected by an anxiety disorder during the lifetime, with anxiety being twice as common in women as it is in men. The treatment of anxiety is difficult, but effective, and it often requires a combination of various practices, such as trigger prevention, counseling, or use of alternative therapies, like aromatherapy or meditation. In some cases, pharmacological treatment is necessary. Hawthorn, a medicinal herb, is known to reduce anxiety, strengthen blood vessels, regulate blood pressure, treat high cholesterol, and prevent atherosclerosis. Palpitations are characterized by the sensation of your heart pounding, fluttering, or skipping a beat. They can be a few seconds short or last for hours. Many medical conditions, including heart disease or overactive thyroid, as well as numerous triggers, such as caffeine or stress, contribute to the episodes of palpitations. Therefore, all instances of an irregular heartbeat should always be evaluated by a medical doctor to ensure they are not a threat to your health. Generally palpitations are not considered life-threatening, and healthy practices, like consuming Omega-3 fatty acids or daily exercise, can help you strengthen the heart by lowering cholesterol and blood pressure. The treatment and management of chest palpitations depend on their underlying cause, and occasionally require prescription medications or surgical interventions. Relating palpitations to anxiety does not come natural to most people. Many women experiencing a rapid heartbeat automatically assume the most serious diagnosis, such as a heart disease or other organs' dysfunctions. 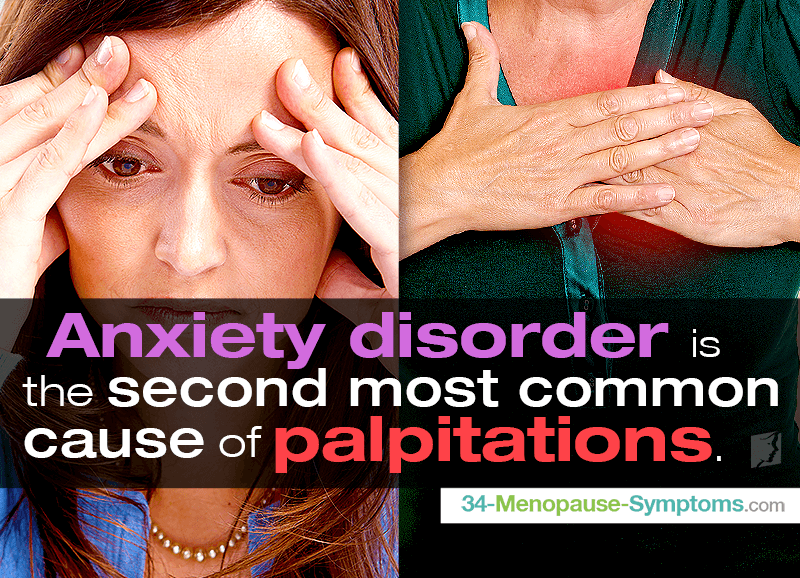 In reality, anxiety disorder is the second most common cause of palpitations, with heart disease leading the list. These conditions are considered psychosomatic, which means they are triggered and aggravated by a mental factor, such as stress or fear. Faced with a challenging situation, your body enters the “fight-or-flight mode”, which is a defense mechanism of your sympathetic nervous system. This triggers a sudden release of large amounts of three stress hormones, adrenaline, norepinephrine, and cortisol, from the adrenal glands and the brain. The result is a rapid heartbeat, tingling sensations in hands and feet, lump in the throat, atypical chest pain, and shortness of breath. Anxiety and palpitations are often interconnected. Psychosomatic palpitations are not life-threatening, but they should be adequately managed as much as possible to minimize subsequent cardiac complications due to constant wear and damage to the heart. Ask your doctor for a proper medical work-up to rule out other underlying health issues for these conditions. Learning the most probable causes for rapid heart rate might be a good way to start.